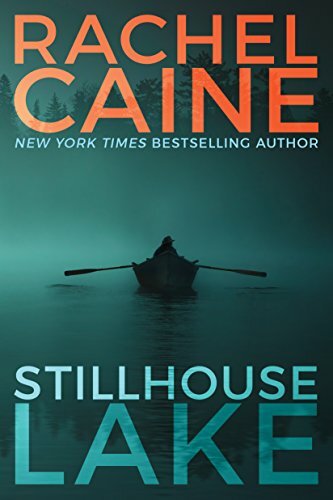 'Stillhouse Lake' by Rachel Caine is a white-knuckle thrill ride – AiPT! Nothing supernatural here except Caine’s talent for great character work and strong storytelling. Books about serial killers are a dime a dozen. Books about the family a serial killer leaves behind, however, are a lot more interesting (to me at least). Especially when they’re are as riveting and well written as Rachel Caine’s Stillhouse Lake. To the average observer, the Royals were a painfully average/stereotypical midwestern family. They fit the mold so well, in fact, that you almost expected Gina and Melvin to have 2.3 kids instead of the actual two that they do. Unfortunately for Gina, her comfortable life and the lives of her children are violently upended when a drunk driver plows into their garage. While this would present an insurance headache and home repair work for anyone, the incident had the added bonus of exposing Mr. Royal as a prolific serial killer. Even worse, he was torturing his victims right under his family’s nose, all while pretending to be a husband and father. Years later, Gina has changed her name to Gwen Proctor, one of many steps she’s taken in an effort to protect herself and her children from those who believe that there’s no way she couldn’t have been involved…or just internet trolls who’ve settled on them as a target for real-life violence. After multiple moves, Gwen feels like she might have finally found a place where she and her children try to start a new life. As you might imagine, this notion is blown to smithereens when a body shows up in the lake next to their house. Things get even worse when Melvin starts sending them letters from jail, hinting strongly that he can do plenty from behind bars to ruin their lives…or worse. I love a novel with a good opening–and it doesn’t get much better than the first chapter of Stilhouse Lake. What makes this book really shine, however, is the fact that once it grabs a hold of you during those first few pages, it absolutely refuses to let go. Rachel Caine (pen name for Roxanne Longstreet Conrad) does a number of things exceptionally well. First and foremost, she creates some of the best written characters in a piece of horror fiction this side of Lauren Beukes and Stephen King. Gina Noble/Gwen Proctor in particular is a masterclass in how to create a believable/relatable hero navigating an unfathomable situation. She’s a badass, to be sure, but by necessity rather than nature. The specter of her serial killer ex-husband is dwarfed by the specter of the trauma she’s experienced as an unwitting accomplice/cover for her husband’s crimes along with years of relentless threats against her family. She’s furious, terrified, and often bewildered, but also able to compartmentalize and focus on the one thing that matters more than anything to her: Her children. Speaking of them, Atlanta (she obviously got to chose her own name) and Conner are also great. Instead of being written with homogenous “kid” characteristics, Caine deftly portrays their age difference, their respective relationship to their mother, and the way they are processing such an insane/awful change in their lives. Of course, no serial killer book would be complete without its terrifying figure to center the fear around. Once again, Caine nails it. Instead of writing Melvin as an over-the-top psycho, she measuredly reveals him as a genuine sociopath–a monster so detached from humanity that he can’t comprehend how anyone could stand against his depravity and self-gratification. Even the supporting characters in Stillhouse Lake are well written and unique. It not only makes for great reading, but also makes you genuinely care for them when things start to go south, which they most definitely do–and Caine shines there, too. She perfectly weaves mystery, horror, family, a coming-of-age, and even a little romance into a plot that is relentlessly engrossing and immensely enjoyable. As great as the first three quarters of the book is, the eventual reveal/final confrontation was a bit of letdown. It definitely wasn’t bad–the action on the final few pages is all types of awesome–but it did make me yearn to be back on the initial journey with these characters rather than where we ended up. One plot point in particular really bugged me, too. I can’t say much at all without giving it away, but let’s just say that there have got to be more efficient ways of doing someone wrong. It also didn’t help that a giant loose end gets dropped in our laps at the end. It’s a fun cliffhanger (maybe even a bit expected), but it still left me more frustrated than satisfied…. …that said, I did totally buy the next book in the series immediately after closing the first one. Nothing supernatural here except Caine’s talent for great character work and strong storytelling. Stillhouse Lake is a white-knuckle thrill ride that doesn’t forget how important a strong narrative is in generating fear. If you’re looking for a great read that’ll keep you up late (turning pages and checking that your doors are locked), then go pick this one up. Despite a good ending that doesn't quite live up to the great setup, Stillhouse Lake is a fantastic read filled with exceptional characters and bone chilling fear. Rachel Caine creates wonderful/thoughtful characters, particularly her protagonist, Gwen Proctor (who feels like a distant relative to Elenaor Ripley). No xenomorphs here, but the very human monsters in Stillhouse Lake are just as terrifying and relentless. The narrative grabs you from the first page and never lets go. The ending is good, but doesn't quite live up to its fantastic setup.